I don’t mention this often, but my 3yo has been in speech therapy since he was 21 months old. At two years old he had NO words. So I am sure you can imagine the communication barrier we struggled with. Fortunately, he has been diagnosed with nothing more than a speech delay and ever since he turned 3, he has been catching up quickly. I credit a lot of his progress to a speech therapist we see every Tuesday and most recently to a wonderful government funded Early Childhood Special Education school he attends on Thursdays. The program encourages language development and he receives focused attention. For the past two weeks they have been reading a book called “Pete the Cat: I love My White Shoes” by Eric Litwin, art by James Dean. I had never heard of this book, but my son made sure to tell me all about it when he got home. It was the first time I’ve heard him tell me the entire sequence of a story and attempt to sing the song that went with the book. He usually only sings songs he is comfortable with (like ABC’s and Twinkle Twinkle). This prompted me to look up the book on youtube where I came across this adorable video of the author and illustrator giving a live narration of the story. At this point, I fell in love with this book too. 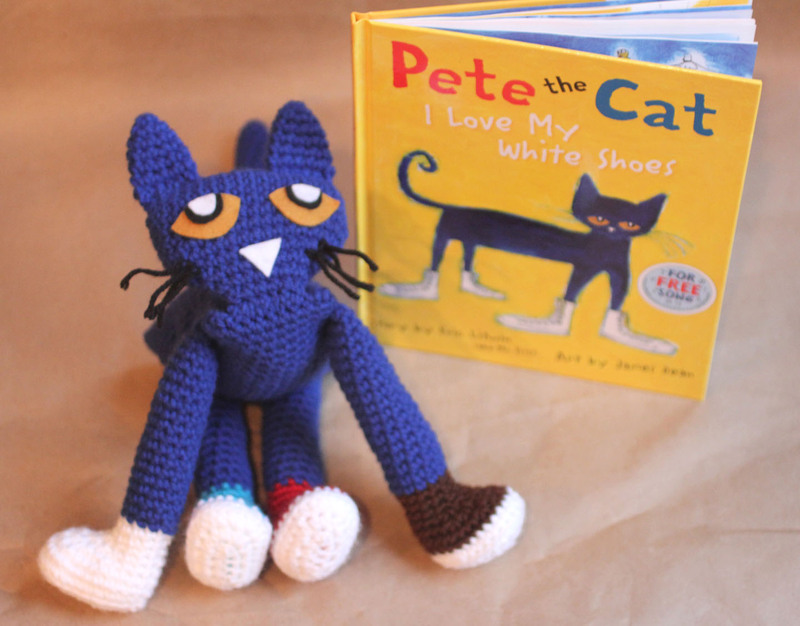 Pete the cat has become our new favorite character and for good reason: he is one cool cat! He has awesome shoes and he says things like “groovy,” “rock and roll,” and “everything is cool.” But best of all, Pete has a wonderful moral to his story: “No matter what you step in, keep walking along and signing your song…because it’s all good.” I knew at this point that I would have to crochet my son a Pete the Cat doll to go along with his new favorite story. He has been patiently watching me make the different color shoes and body parts all week. And now it’s finally done! I pretty much freehanded this doll but took some notes as I went along. So I apologize if you find this pattern incomplete or confusing. Note: Your last stitch should not be in the same stitch as you chain. Round 11- 28: Change color to blue and SC around (no need to join each row at this point) in continuous rounds. Rd 9-13: SC around but when you get to each end, start making SC Decreases. Start with 1 SC decrease on each end, then 2 decrease on each end for the next row, etc. This doesn’t need to be an exact science. Crochet is very forgiving. Eyes and nose were cut from felt and hot glued on on, the black whiskers were tied on using black yarn. SC around (11 sc), fasten off, weave in ends. Do not stuff. sew onto head. Rd 2-24: Continue to SC around but increase by making 2 SC when you get to each end. So for instance, Rd 2 would look like: 2 SC, SC 10, 2 SC, SC 10 and Rd 3: 2 SC, SC 11, 2 SC, SC 11, and so on. Depending on how you want the body to look, you may want to switch between increasing and doing rounds of just SC’s. You could even just SC around for awhile to get a longer, straighter body like how the artist has drawn him. Sew all limbs closed and then sew seems together. Don’t crochet? You can purchase a Pete the Cat doll from Amazon! I also encourage you to add this book to your collection. I am sure you will love it as much as we do. It currently sits at #5 on the The New York Times Best Seller List! 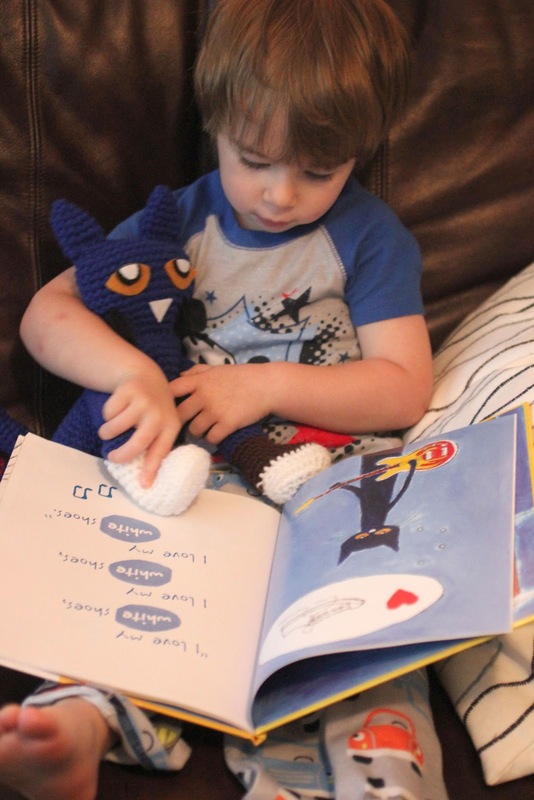 Looks like your son is enjoying his Pete the Cat very much!! Wonderful job!! My daughter happened to be sitting next to me and shouted that she wants one. Of course we had to watch the video about a million times too! It looks great. I guess I'll be making one for her bday coming up…along with the book which is now one of her faves! We never heard it until we went to a library class last month and they read it. Thanks! This is such a cute cat and story! Great Job! Thanks so much for this. We LOVE Pete the Cat here! I am going to have to make one. You have an adorable blog! I love Pete the Cat! Found you through One Artsy Mama and following now via GFC. Would love for you to stop by for a visit! I just had to comment on this because its amazing! I am an SLP and avid crafter so when I saw this I died! I just introduced Pete the Cat to my preschool students and I, like you, am in love with Pete. Thank you so much for sharing you thoughts and pattern! As soon as I have the time (and yarn) I am going to start one for myself!!!! Thank you sooooo much for this pattern!!!!!!!!!!!! My grandaughter loves Pete the Cat!!! She was also speech delayed and went to speech therapy, and is now attending Early Childhood Developement. She has done wonderful, considering last year this time she only said two words, and now she talks constantly. I love your patterns, keep up the great work!!!!!!!!!! 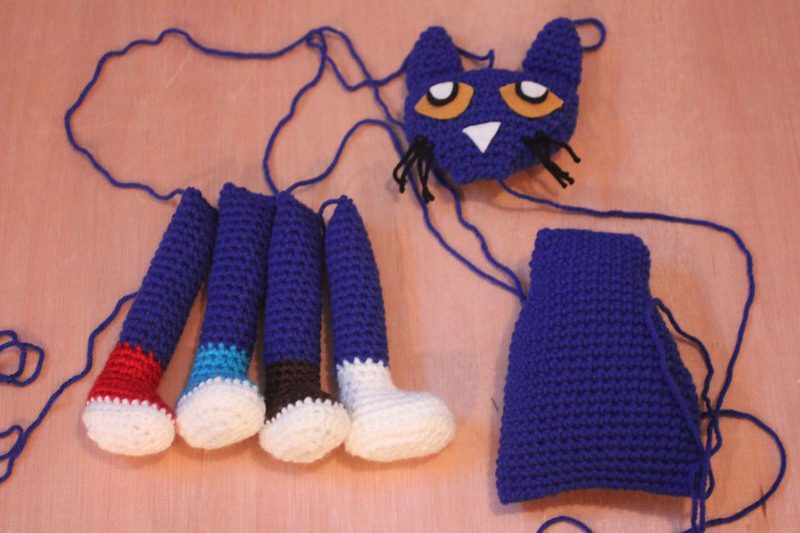 my sons class loves pete the cat i think ill make a couple for his class to go with the books !!!!! Again I cannot thank you enough for this pattern…. My daughter bought Pete the Cat from her book fair a couple weeks ago & has not put it down lol…. 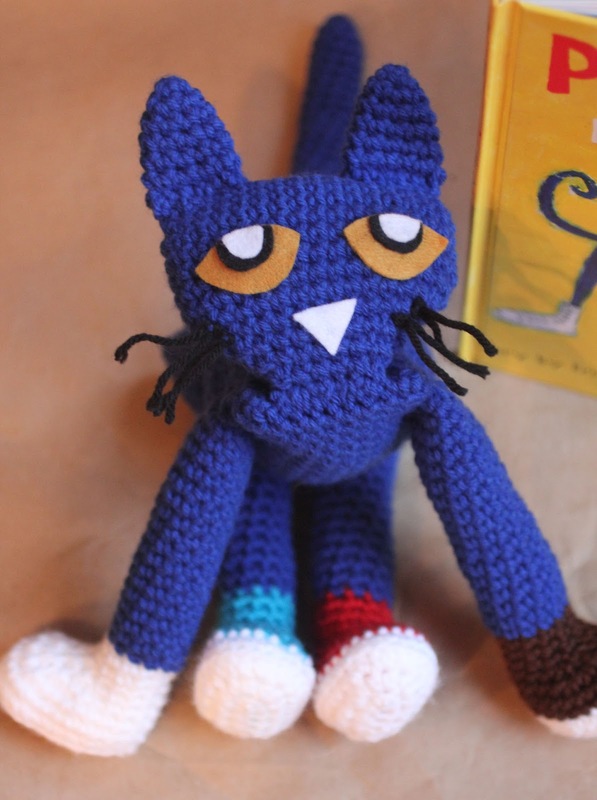 After asking you where to find the pattern & looking it over, I spoke to the teacher & am going to take the Pete the Cat doll I crochet along with my daughters book (and maybe another one in the series!) & we're going to have a "Pete the Cat" reading circle & maybe make some crafts after I read the book during circle time. My daughter is absolutely thrilled with this & wants me to start NOW lol but I have a few hat orders I have to complete along with Christmas presents to finish too so her patience is wearing thin…. :p I will post pics from her classroom as soon as I get home the day we read… Thank you again for being so inspiring & creative!!!!!! Because of you I get to be even more involved with my daughter at school… to me that is priceless & words alone cannot express my gratitude!!!!!! This is wonderful! One of the classes in our ECSE Center has this theme for their classroom! I am sure they would love to have one of these kitties! Oh my gosh, oh my gosh!!!!! I have to make this! so cute so cute so cute! So awesome I'm going to make this for my nephew! Thank you so much! he is so awesome!!! Will definitely have to make one of these!!! Thank you for sharing! When making the legs, what do you mean when you say to do 5 sc on the other side of the chain? Does that mean the bottom of the chain? Thank you! On the legs; I'm having a hard time between rows 5 and 6. Row 5 shows ending with 24sc. Row 6 calls for 6sc then 6sc dec then 6sc. I looke up Doug the sc dec and I still have 6 st left over. I just wanted to know if I'm missing something. This is amazing. My four year old has speech issues. And Pete the Cat and his Four Groovy Buttons has helped SOOOO much! Our story with Pete is very similar to yours. It was the first time my son actually conveyed a story to me completely. Wonderful book and The cat,Any way we can help our Children is the way!! Does anyone make these and sell them? I would love to purchase one. 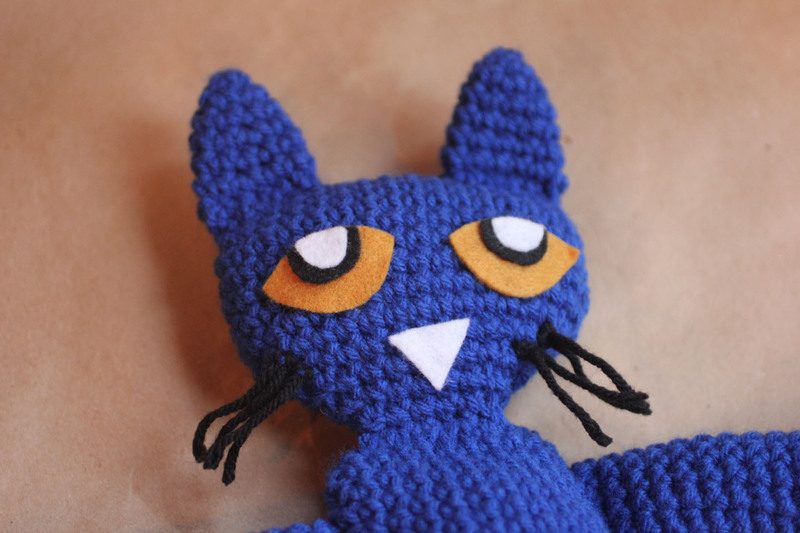 Colleen, you can find a handmade Pete the Cat on Etsy.com. Thank you so much for the pattern. So cute. 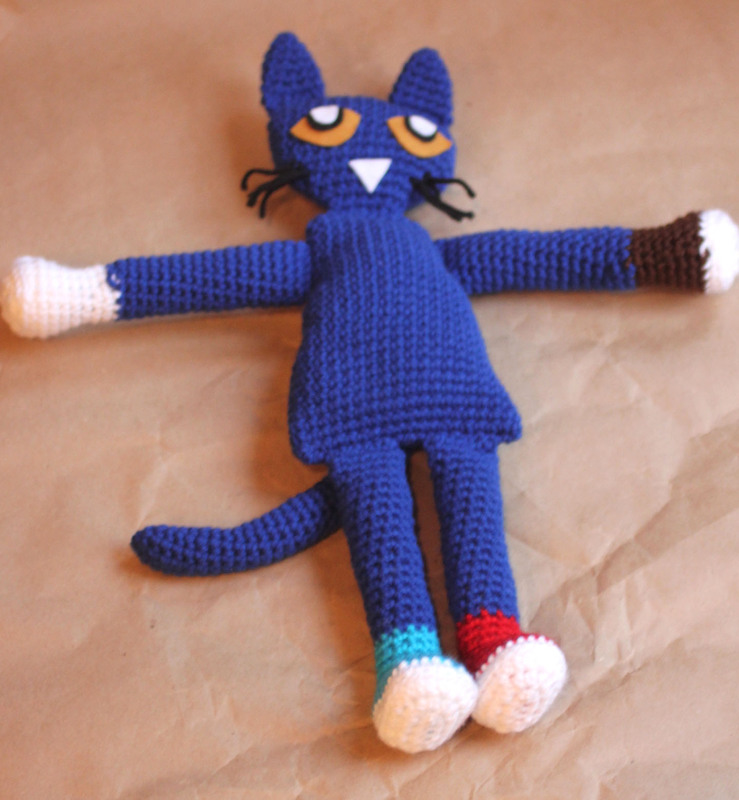 I will make it for my daughter who LOVES Pete the Cat. Hi, first off, i LOVE that you shared this pattern 🙂 I was super excited to start it! but i’m having trouble with the head. I noticed someone else had asked about it too. So was wondering if you had it written out better. 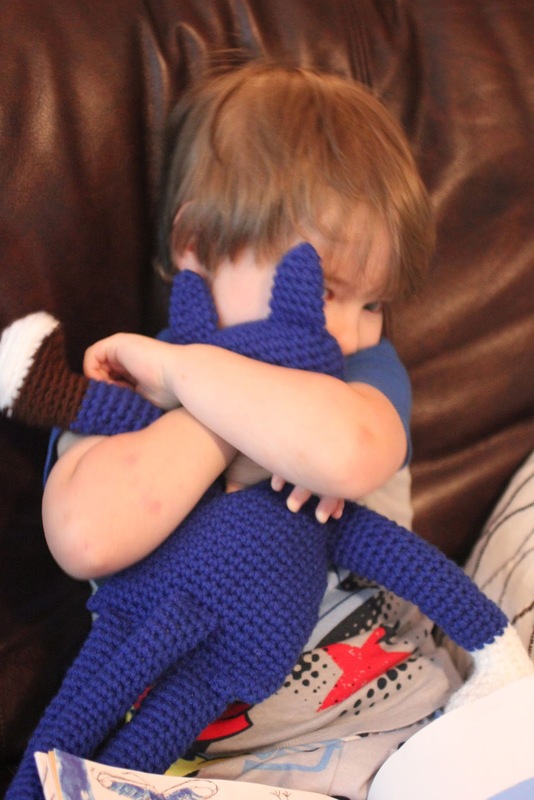 My 5 year old grandson Bubba Sal loves Pete the cat. I just got him 2 books for valentines Day. He also has a speech problem. His sister is 5 1/2 years older then him and we all thought he didn’t talk because Veronica talked for him. When he finally started talking he could not speak clearly and stuttered. My daughter got him into a pre school program for children with learning disability’s. He also went to summer school and is now in kindergarten. He is speaking clearer but still has a long way to go. Sometimes when he gets so excited he stutters and then breaths heavy which is what happened when I gave him the books. He was trying to tell me that he read the book in school. At least now I can understand him even if its not that clear. My son in law is great and really works with him. I love it when he reads to me. I baby sit every Wednesday night so I will get him to read the book to me. I won’t tell him that I am going to make Pete. He will love it. They were selling one at Barnes and Noble for $20 but I have so much yarn stash this will be easy. Best of luck to you and your family. I will keep you in my prayers. I love your web site. I have been crocheting since I was 7. I made minion hats, sock money, aligator, hello kitty, Thomas the tank engine, and I am now in the process of making ear flap hats for our local shelter. You have the best projects! Im starting a Pete today to make for my daughters preschool classroom then ill make one for her too! I love this and am in progress of making 3! Wondering about finishing up the body, am i just to sew it closed or end it like the head with the gradual dsc’s? TIA!! Thank you for the pattern. My 2 daughters love Pete the cat. I plan on surprising them with this guy!